If you've ever read any of those Choose Your Own Adventure books when you were a kid, then you'll be immediately familiar with Scourge Of Worlds: A Dungeons & Dragons Adventure even though it's the first of it's kind. 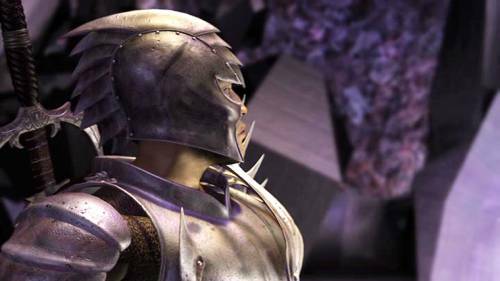 Called a DVDn, or an interactive movie, this 3D animated adventure stops at several points along the story and allows you to make the decisions that the characters are pondering at that very moment. This is fun, having control over the group's decisions, but soon you'll notice that the outcomes of some decisions eventually converge back to points which you have already seen. The first couple times I found myself watching those scenes again, but after that I quickly found myself hitting the chapter skip button on the remote so I could just jump to the next decision. Of course, this unique design also makes it a bit more difficult to summarize the movie, since the story will change based on your decisions. Basically it's about a warrior who is on a quest to find some mystical object which will supposedly cleans all evil. A group of elves is attempting to prevent this, and you have to decide what part you are going to play in this quest. Overall, pretty simple storyline without many twists or surprises. Now, although the 3D character designs are no where near as good as the top quality graphics we've seen in some high end feature films such as Gollum from Lord of the Rings or that Final Fantasy movie, they're still pretty nice looking, and I'd say on par with Roughnecks: The Starship Troopers Chronicles, another very well done 3D animated show that I thoroughly enjoy. The animation is also very nice, extremely smooth and realistic looking. There's no doubt that they used motion capture here. The voice acting was also done well, for the most part. There were times when the characters seemed to be lacking any kind of emotion, but most of the time the acting was most believable. 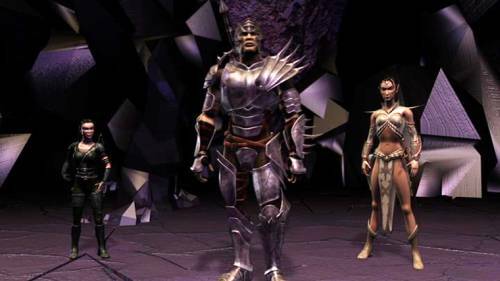 The casting seemed to really suit the characters, which helped, although the dialog seemed a little bit too present-day which I really think had a strong hand in preventing me from getting drawn in to their fantasy world of warriors, halflings, elves, and monsters. I would really like to see future projects of this sort, but only if they could increase the overall production values. 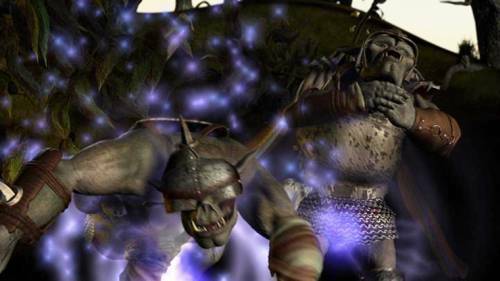 Give us visuals that can blow us away, whether it be amazing 3D animation or detailed live-action experiences. Give us a more engaging story, with fewer number of decision paths that converge, and more that will drastically change the story. Give us character development, and a reason to care. Force us to get emotionally involved, not just physically involved, as that's what makes a great movie! 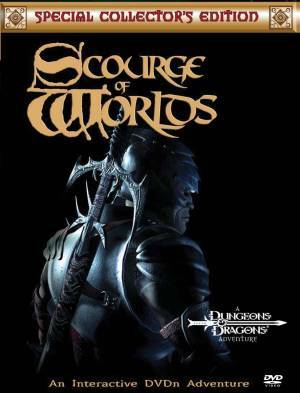 Scourge Of Worlds: A Dungeons & Dragons Adventure was originally in 2003, but Rihno in releasing a 2005 2 disc Special Collector's Edition that has six different endings (as opposed to 4 in the original) and a making of featurette.